Bridge Engine Order Telegraph A. ROBINSON &amp;amp; Co.
To view our current inventory of antique and vintage binnacles, engine order telegraphs and helms, click here! This Relic Has Been Sold. Thank you! 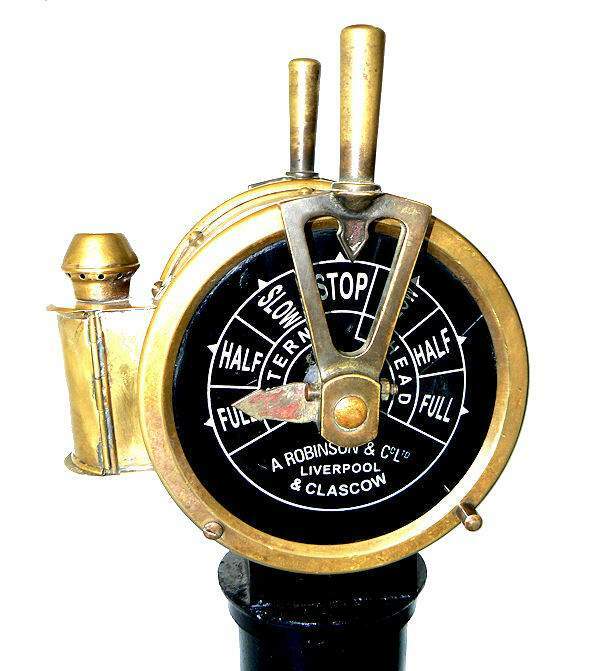 Presented is a smaller size, two control, Engine Order Telegraph for the bridge from A. Robinson of Liverpool and Glasgow whose operations date back to 1780. In 1968, Robinson was purchased by the largest maker of these devices, Chadburns, who at one time accounted for over 75% of the worlds marine telegraph production and is still in business today. They now make a diversified list of marine products. 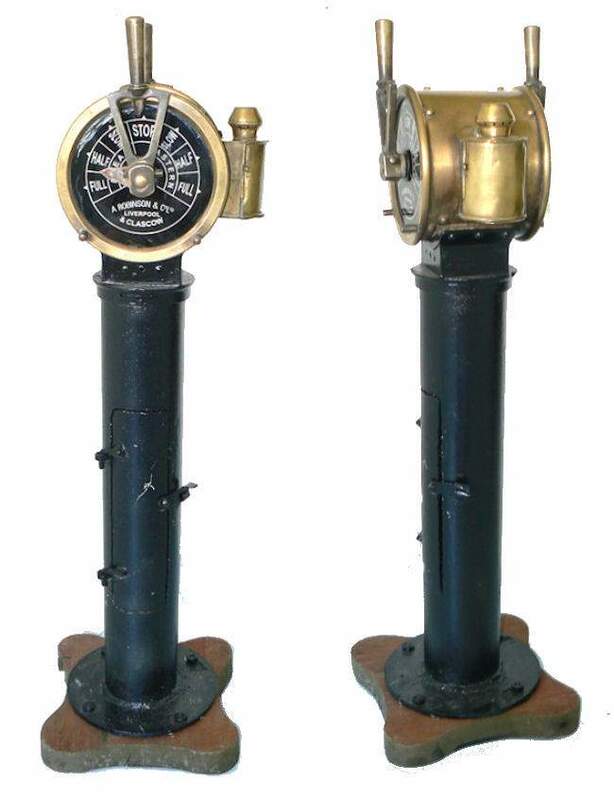 This style solid brass enunciator, mounted on an iron pedestal, was installed in the bridge of a smaller sized vessel. It has a double black enameled dial with the standard Ahead and Astern commands STOP. SLOW, HALF, FULL. Moving the handles through and back to the speed rang an internal bell. 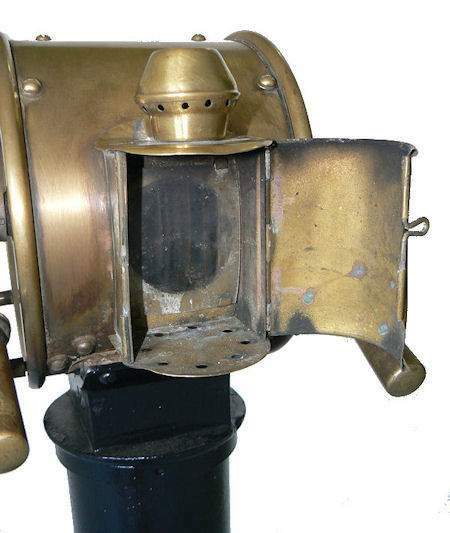 The external kerosene lamp housing helps date it to late in the 19th Century or the Turn of the 20th Century. Not pictured, is the lamp which is included. It was discovered in New England. Overall 36 1/2"H x 4 1/2" tube X 9"
CONDITION: In good original condition with all hardware and internal chains present. The handles move, but the bell does not ring. The face plates are replacements, and Glasgow is misspelled. 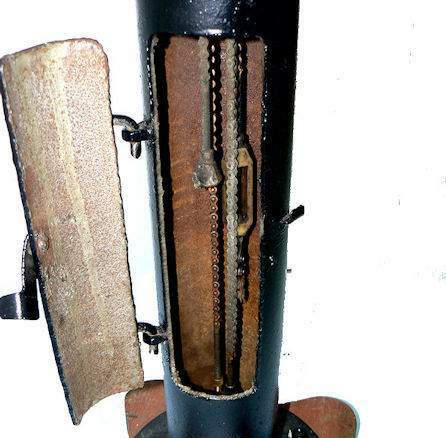 The burner for the kerosene lamp is missing. 1898. CHADBURN'S (SHIP) TELEGRAPH CO. LTD was formed and the brass pedestal telegraph was by now well established. It included vertical levers and scales for Bridge use, with a reply telegraph in the Engine room, but also steering and docking telegraphs. 1920. Electric telegraphs, steam whistles and fog bells were developed to meet demand from new motor ships - by now competition was discernible, but Chadburn still held a 75% monopoly worldwide. The company also made oil separators and milling machines. Searchlight controls also proved a success. William's son, Roy Chadburn took over the helm as M.D. as World War I ended and he was the instigator of these two product lines; he left to start up a sister company in Canada eight years late.